Pétanque (French pronunciation: ​; Occitan: petanca ) is a form of boules where the goal is to throw hollow metal balls as close as possible to a small wooden ball called a cochonnet (literally "piglet") or jack, while standing inside a starting circle with both feet on the ground. The game is normally played on hard dirt or gravel, but can also be played on grass, sand or other surfaces. Similar games are bocce, bowls and (adapted to ice) curling. The current form of the game originated in 1907 in La Ciotat, in Provence, France. The French name pétanque (borrowed into English, with or without the acute accent) comes from petanca in the Provençal dialect of the Occitan language, deriving from the expression pès tancats [ˈpɛs taŋˈkats], meaning 'feet together' or more exactly 'feet anchored'. Boules games, broadly speaking, are games that involve rolling or throwing balls toward some sort of target. The category includes such games as (French) petanque, (Italian) bocce, (English) lawn bowling, and (American) bowling. Boules games have a very long history. Games involving the throwing of objects at a target are probably as old as humanity itself. Boules player, by Paul Gavarni, 1858. The ancient Greeks are recorded to have played a game of tossing coins, then flat stones, and later stone balls, called spheristics, trying to have them go as far as possible, as early as the 6th century BC. The ancient Romans modified the game by adding a target that had to be approached as closely as possible. This Roman variation was brought to Provence by Roman soldiers and sailors. A Roman sepulchre in Florence shows people playing this game, stooping down to measure the points. After the Romans, the stone balls were replaced by wooden balls. In the Middle Ages, Erasmus referred to the game as globurum, but it became commonly known as boules (i.e. 'balls'), and it was played throughout Europe. King Henry III of England banned the playing of the game by his archers, and in the 14th century, Charles IV and Charles V of France forbade the sport to commoners; only in the 17th century was the ban lifted. By the 19th century, in England the game had become "bowls" or "lawn bowling". In France it was known as boules and was played throughout the country. The French artist Meissonnier made two paintings showing people playing the game, and Honoré de Balzac described a match in La Comédie Humaine. In the South of France the game evolved into jeu provençal (or boule lyonnaise), similar to today's pétanque, except that the playing area was longer and players ran three steps before throwing the ball. The game was played in villages all over Provence, usually on squares of land in the shade of plane trees. Matches of jeu provençal around the start of the 20th century are memorably described in the memoirs of novelist Marcel Pagnol. 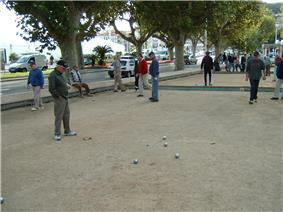 Pétanque in its present form was invented in 1907 (or possibly 1910) in the town of La Ciotat near Marseilles. It was invented by Ernest Pitiot, a local café owner, to accommodate a French jeu provençal player named Jules Lenoir, whose rheumatism prevented him from running before he threw the ball. In the new game, the length of the pitch or field was reduced by roughly half, and a player no longer engaged in a run-up while throwing a ball—he stood, stationary, in a circle. The first pétanque tournament with the new rules was organized in 1910 by the brothers Ernest and Joseph Pitiot, proprietors of a café at La Ciotat. After that the game spread quickly and soon became the most popular form of boules in France. Before the mid-1800s, European boules games were played with solid wooden balls, usually made from boxwood root, a very hard wood. The late 1800s saw the introduction of cheap mass-manufactured nails, and wooden boules gradually began to be covered with nails, producing boules cloutées ("nailed boules"). After World War I, canon-ball manufacturing technology was adapted to allow the manufacture of hollow all-metal boules. The first all-metal boule, la Boule Intégrale, was introduced in the mid-1920's by Paul Courtieu. The Intégrale was cast from a bronze-aluminum alloy. Shortly thereafter Jean Blanc invented a process of manufacturing steel boules by stamping steel blanks into hemispheres and then welding the hemispheres together to create a boule. With this technological advance, hollow all-metal balls rapidly became the norm. The international governing body of petanque is the Fédération Internationale de Pétanque et Jeu Provençal (FIPJP). It was founded in 1958 in Marseille and has about 600,000 members in 52 countries as of 2002. Many countries have their own national governing bodies, including the FPUSA (USA) and the FFPJP (France). The first FIPJP (Men's) World Championships were organized in 1959. The most recent championships were held in Faro (2000), Monaco (2001), Grenoble (2002, 2004 and 2006), Geneva (2003), Brussels (2005), and Pattaya, Thailand (2007). Fifty-two teams from 50 countries participated in 2007. FIPJP - Fédération Internationale de Pétanque et Jeu Provençal is the international governing body for Pétanque. Its web site contains a link to the official rules of Pétanque and a link to a list of its national members. FFPJP - Fédération Francais de Pétanque et Jeu Provençal is the governing body for Pétanque in France, and the most important national member of FIPJP. FPUSA - Federation of Petanque U.S.A. is the governing body for Pétanque in the United States. It is a member of FIPJP. ^ The cochonnet is also sometimes called a bouchon (literally "little ball", from the Occitan bochon) or le petit ("the small one"). ^ Marco Foyot, Alain Dupuy, Louis Almas, Pétanque - Technique, Tactique, Etrainement. Robert Laffont, 1984. ^ Marco Foyot, Alain Dupuy, Louis Dalmas, Pétanque - Technique, Tactique, Entrainement, Robert Laffont, 1984. ^ Giol, Charles (November 2011). "La pétanque". Historia. ^ History of the FIPJP at the FIPJP web site. Men playing pétanque next to the Fort St. Louis in Toulon. Action on the Pétanque field in Batignolles. To win a game without the opposing team scoring any points; a shutout game. When a player loses 13 to 0, he is said to fanny ("il est fanny", he's fanny, or "il a fait fanny", he made fanny) and must kiss the bottom of a girl named Fanny. Virtually everywhere in Provence where pétanque is played, you will find a picture, woodcarving, or pottery figure of a bare-bottomed lass named Fanny. Often, the team that made "fanny" has to buy a round of drinks for the winning team ("Fanny paie à boire! ", "the fanny pays for the drinks!"). (pronounced care-ROW). A shot that knocks an opposing boule away from the jack and replaces it (in very nearly the same spot) with the thrower's own boule. Basically, the perfect shot. Video: Diego Rizzi demonstrates a perfect carreau. (French: une portée) To throw one's boule in a high arc so that when it lands it only rolls minimally. Video: Marco Foyot demonstrates the high lob. 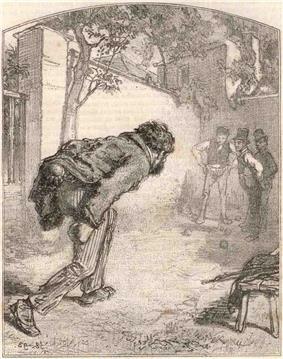 To throw one's boule at an opponent's boule (or at the jack) in an attempt to knock it out of play. When the opposing team has a boule positioned very close to the jack, often the best strategy is to attempt to shoot it. A team in a desperate situation may attempt to save itself by shooting the jack out of bounds. To throw one's boule with the intent of stopping near the jack (also known as placing). Roughly "A ball in front is a money ball". This maxim reminds players that when pointing, the most valuable place for a boule is in front of the jack. In that location, it prevents opponents from throwing directly toward the jack, and hitting it will push it even closer to the jack. A team is said to "have the point" if one of its boules is closer to the jack than any of the opposing team's boules. 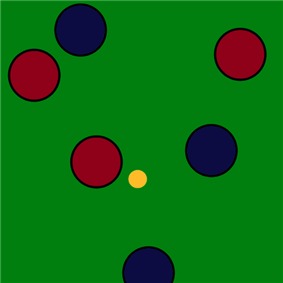 A team that has the point is basically in a winning position, so the team that does NOT have the point throws the next boule and attempts to gain the point. Throw the jack to a the distance at which your own shooter is most comfortable, or the opposing shooter is least comfortable. Aim for a location on the terrain that your own pointers favor, or that might be difficult for the opposing team's pointers. Disorient the opposing team by refusing to get in a rut. At each opportunity, throw the jack to a new position on the terrain, and alternate long and short distances. When playing against a left-handed pointer, try to exploit the fact that certain locations may be difficult to reach for left-handed pointers. Generally speaking, it is a bad idea to shoot with your team's last boule. In most cases, the better strategy is to "limit the damage" by pointing your team's last boule close enough to the jack to limit the opposing team to winning only one point. As a pointer, if you point a boule very close to the jack, you force the opposing shooter to shoot it immediately. That may be a Bad Thing if you really wanted to keep that boule. Or it may be a Good Thing if you're trying to force the opposing shooter to exhaust his supply of boules. Remember: boule devant, boule d'argent ("ball in front, ball worth money"). A boule located in front of the jack is much more valuable than one behind the jack. 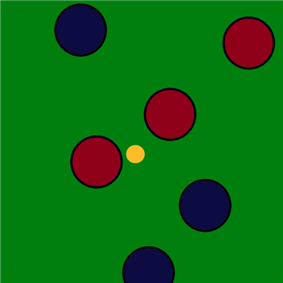 A boule in front blocks the opposing team from easy access to the jack, and it may also (intentionally or accidentally) be hit and pushed closer to the jack. Players who are skillful enough to shoot effectively are called shooters; players who usually point are called pointers. (The French terms are tireur and pointeur, respectively.) As a matter of strategy, pointers play first and shooters are held in reserve in case the opponents place well. Good pointing is what scores points, but national and international championships are usually dominated by skillful shooters, who target any opposing boule that comes close to scoring. To make his boule come to rest in a particular spot, usually as close as possible to the jack. This is called pointing. To make his boule directly hit an opponent's boule with the goal of knocking it away from the jack. This is called shooting. The best shot of all is a carreau—a shot that knocks away the opponent's boule, leaving the thrown boule exactly in its place. Generally speaking, a player throws a boule with one of three objectives. In the United States, proponents of pétanque such as author Byron Putman often urge the use of non-dedicated public terrains – public walking paths, playground areas, dirt/gravel parking lots, and baseball infields – as terrains. For tournaments, a large playing area is subdivided and marked off (typically using nails and string) into rectangular marked terrains (also known as "courts" or "pistes") so that multiple games may be carried on simultaneously. For tournament play, a marked terrain is a rectangle at least 4 meters wide and 15 meters long. An area where a single pétanque game is played is called a terrain. A playing area is an area where one or more petanque games are being played. At any given time a playing area may be hosting one or more terrains. In France, village squares and park pathways are often used as pétanque playing areas. In addition, many towns have recreational facilities (boulodromes) constructed especially for playing pétanque. Pétanque can be played on almost any flat, open space. The ground may be irregular and interrupted by trees or rocks, and the surface is likely to be uneven, with some areas hard and smooth and other areas rough and stony. When an area is constructed specifically for the purposes of playing petanque, the playing surface is typically loose gravel, decomposed granite, brick grog or crushed sea shell. Sandy beaches are not suitable, although light plastic boules are sometimes used to adapt the game for the beach. There is no requirement for backboards or sideboards (as in bocce), but dedicated playing areas are often enclosed in boards or some other structural barrier. The jack is a small ball made of wood, usually boxwood or beechwood. Modern regulations require the jack to be 30mm in diameter (+/- 1mm). In the past jacks were often left "natural"—unfinished or with a clear finish—but nowadays they are often painted in bright colors. In recent years the FIPJP began authorizing the manufacture of non-wooden "synthetic" or "resin" jacks, but many national organizations (including the FPUSA) forbid the use of synthetic jacks for safety reasons. 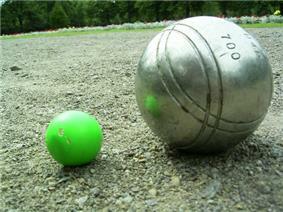 Leisure boules are boules that do not meet competition standards, but are less expensive than competition boules and completely adequate for "backyard" games. Unlike competition boules, leisure boules are a "one size fits all" affair — they come in one weight and size. A player can choose a boule whose size fits the size of the player's hand. The weight and hardness of the boule depends on the player's personal preference and playing style. Pointers tend to favor smaller, heavier, and harder boules, while shooters tend to favor larger, lighter, and softer boules. When purchasing competition boules, a purchaser has a choice of a number of characteristics of the boules, including the size (diameter), weight, and hardness of the boules. must have a diameter between 70.5 and 80 mm. must have a weight between 650 and 800 g.
must not have been filled with anything (sand, lead, mercury, oil) or tampered with in any way. must bear engravings showing the manufacturer's name and the weight of the boule. may include engraving of the player's name or initials. Each team should have suitable measuring equipment. In practice, this means that most players carry a tape measure for measuring close points. 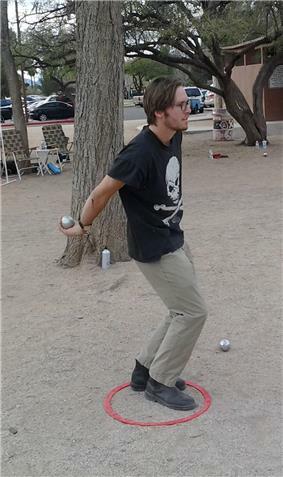 Boules can be thrown in any way the player prefers—under-hand, over-hand, whatever. The usual way to throw a boule is to hold it with the palm of the hand downwards, and then throw with an upward flick of the wrist. Throwing this way puts backspin on the boule, giving the player more control and more flexibility when throwing. The boule can be rolled or thrown at any height, up to and including a high lob (une portée). The circle can be moved back in the line of the previous end if there is not room to play a 10 meter end. On a marked terrain (a terrain marked with strings), a boule is considered to be out-of-bounds and dead only if it has completely crossed the boundary string. But assuming that the end finishes normally, with the jack still alive, then the team with the closest boule receives one point for each of its boules that is closer to the jack than other team's closest boule. If the end stops because the jack is dead, then one of two things can happen. If one (and only one) team still has boules left to play, that team scores one point for each boule that it still has in hand. Otherwise neither team scores any points in the end (like an inning in baseball in which neither team scores any runs). An end is complete when both teams have played all of their boules, or when the jack is knocked out of play (goes "dead"). Team Red has two boules closer than Team Blue's closest boule. Red scores two points. Blue scores nothing. Team Red has the boule closest to the jack, but the second-closest boule belongs to Team Blue. Red scores one point. Blue scores nothing. The team that wins an end, starts the next end. A player from the winning team places (or draws) a new circle around the location of the jack at the completion of the previous end, and throws out the jack and the first boule to start the next end. If the closest boules from each team are an equal distance from the jack, then the team that played last plays again. If the boules are still equidistant then the teams play alternately until the position changes. If the boules are still equidistant at the end of the "end" (French: mène) then no points are scored by either team. A player from the team that threw the jack, throws the first boule. Then a player from the opposing team throws a boule. The team with the boule that is closest to the jack is said to "have the point". The team that does NOT have the point, throws the next boule. (Basically, the team that "has the point" is winning, and it gives the other team a chance to regain the point.) The team that does NOT have the point continues to throw boules until it either (a) gains the point, or (b) runs out of boules. A game begins with a coin toss to determine which team plays first. The team that wins the toss begins the game by placing the circle, throwing the jack, and throwing the first boule. The jack must be thrown to a distance of 6-10m from the inside of the circle. A jack that is thrown too short, or too long, must be re-thrown. In petanque, players throw while standing in a circle. Traditionally, the circle was simply scratched in the dirt. Starting around 2005, red plastic "prefabricated" circles were introduced and they are now very popular. Some clubs prefer to draw the circle the traditional way, while others prefer to use the plastic circles. A circle drawn on the ground must be 35–50 cm in diameter, while a plastic circle must have an inside diameter of 50 cm. As the game progresses, each team accumulates points with the ends that it wins. A game consists of as many ends as is necessary for one of the teams to score 13, the winning number of points. A game consists of several rounds or innings. In French, a round is called une mène, which is usually translated into English as "an end". An end is finished when both teams have played all of their boules. At the end of an end, the team with the boule closest to the jack scores one point for each of its boules that is closer than the opposing team's closest boule. That means that the winning team can score anywhere from one to six points per end. Typically the team that wins the end scores one, two, or three points. Pétanque is played by two teams, where each team consists of one, two, or three players. In the singles and doubles games each player has three boules; in triples each player has only two. The area where a petanque game is played is called a "terrain" (from the French word terrain). Games can be played out in the open (in a public park, say) where the terrain is essentially unbounded, or played on a "marked terrain" with marked boundary lines. The boundary lines can be drawn with chalk or paint, but traditionally the boundary lines are made of strings tightly strung between nails driven into the ground. The largest annual tournament in the USA is the Petanque America Open, held in November at Amelia Island, Florida. There are a number of important world championship tournaments, including the FIPJP Pétanque World Championships which takes place every two years. Perhaps the best-known international championship is the Mondial la Marseillaise de pétanque, which takes place every year in Marseille, France, with more than 10,000 participants and more than 150,000 spectators. In the United States the Federation of Petanque USA (FPUSA) has (as of December 2013) approximately 1,800 members in 40 clubs, and estimates about 30,000 play nationwide. Petanque is actively played in many nations with histories of French colonial influence during the last centuries, especially in Southeast Asia, including Laos, north Thailand, Vietnam, Cambodia, and Puducherry, India, as well as some parts of Africa, e.g. Madagascar. There is also a Canadian petanque federation based in Québec.